Used for stereos and hi-fi systems, home theater sound systems. Connects speaker to receiver, tuner/amplifier. Pre-installed conductors within an overall protective metallic interlocked armor. 45 percent lighter than steel MC cable. Cable reverse wound for ease of pulling and installation. Conductors - solid bare annealed copper per ASTM B-3, stranded copper stranding per ASTM B-8 for conductor. Conductor insulation rated 90 degree Celsius dry, 75 degrees Celsius wet at 600 volt. Conductor insulation is flame retardant, heat resistant PVC with flame, oil and gasoline resistant nylon jacket. General applications: branch, feeder, and service power distribution in commercial, industrial, institutional, and multi-residential construction/facilities, power, lighting, control, and signal circuits, concealed or exposed installations, installed in raceway/conduit, fished or embedded in plaster, installed in cable tray, and as aerial cable on a messenger. UL Classified 1, 2 and 3 hour through penetration firestop systems: W-L-3110, W-L-3113, W-L-31120, W-L-3121, C-A-J-3115, C-A-J-3140, C-A-J-3142, C-A-J-3202, C-A-J-4065, and C-A-J-4066. UL Listed. Pre-installed conductors within an overall protective metallic interlocked armor. 45 percent lighter than steel MC cable. Cable reverse wound for ease of pulling and installation. Conductors - solid bare annealed copper per ASTM B-3, stranded copper stranding per ASTM B-8 for conductor. Conductor insulation rated 90 degree Celsius dry, 75 degrees Celsius wet at 600 volt. Conductor insulation is flame retardant, heat resistant PVC with flame, oil and gasoline resistant nylon jacket. General applications: branch, feeder, and service power distribution in commercial, industrial, institutional, and multi-residential construction/facilities, power, lighting, control, and signal circuits, concealed or exposed installations, installed in raceway/conduit, fished or embedded in plaster, installed in cable tray, and as aerial cable on a messenger. UL Classified 1, 2 and 3 hour through penetration firestop systems: W-L-3110, W-L-3113, W-L-31120, W-L-3121, C-A-J-3115, C-A-J-3140, C-A-J-3142, C-A-J-3202, C-A-J-4065, and C-A-J-4066. UL Listed. Primarily used in conduit and cable trays for services, feeders, and branch circuits in commercial or industrial applications Thermoplastic insulation maximum 90 degrees Celsius. Moisture, heat, oil and gasoline resistant, 600 volt. Premium grade flame retardant PVC jacket. UL Standard 83, RoHS/REACH Compliant. Primarily used in conduit and cable trays for services, feeders, and branch circuits in commercial or industrial applications Thermoplastic insulation maximum 90 degrees Celsius. Moisture, heat, oil and gasoline resistant, 600 volt. Premium grade flame retardant PVC jacket. UL Standard 83, RoHS/REACH Compliant. Inner conductors are type THHN, rated 90 degrees Celsius, 600 volt. Solid strands. Outer jacket is PVC, rated at 75 degrees Celsius. Amp rating of the product is limited to that for 60 degrees Celsius rated conductors per the National Electric Code Article 336. Dwellings not exceeding 3 floors above grade. Exposed or concealed wiring. May be fished through walls, ceilings, and masonry blocks. Use for new wiring or replacement wiring. Only for use in normally dry locations. UL Listed. /2 = 2 insulated wires with bare ground. /3 = 3 insulated wires with bare ground. Type THHN insulation, rated 90 degrees Celsius, 600 volt. Gray PVC jacket. For applications of direct burial, dwellings not exceeding 3 floors above grade, underground feeder to outdoor lighting or apparatus, exposed or concealed wiring in damp, moist, wet, dry, and corrosive locations, general branch circuit wiring and new wiring or replacement wiring. Flame retardant, moisture, fungus, and corrosion resistant. Sunlight resistant jacket. JC-30B Federal specification, ASTM B-3, ASTM B-8 and NY state DOS 16120-880923-2002. UL Listed. Type THHN insulation, rated 90 degrees Celsius, 600 volt. Gray PVC jacket. For applications of direct burial, dwellings not exceeding 3 floors above grade, underground feeder to outdoor lighting or apparatus, exposed or concealed wiring in damp, moist, wet, dry, and corrosive locations, general branch circuit wiring and new wiring or replacement wiring. Flame retardant, moisture, fungus, and corrosion resistant. Sunlight resistant jacket. JC-30B Federal specification, ASTM B-3, ASTM B-8 and NY state DOS 16120-880923-2002. UL Listed. Inner conductors are type THHN, rated 90 degrees Celsius, 600 volt. Solid strands. Outer jacket is PVC, rated at 75 degrees Celsius. Amp rating of the product is limited to that for 60 degrees Celsius rated conductors per the National Electric Code Article 336. Dwellings not exceeding 3 floors above grade. Exposed or concealed wiring. May be fished through walls, ceilings, and masonry blocks. Use for new wiring or replacement wiring. Only for use in normally dry locations. UL Listed. /2 = 2 insulated wires with bare ground. /3 = 3 insulated wires with bare ground. Type THHN insulation, rated 90 degrees Celsius, 600 volt. Gray PVC jacket. For applications of direct burial, dwellings not exceeding 3 floors above grade, underground feeder to outdoor lighting or apparatus, exposed or concealed wiring in damp, moist, wet, dry, and corrosive locations, general branch circuit wiring and new wiring or replacement wiring. Flame retardant, moisture, fungus, and corrosion resistant. Sunlight resistant jacket. JC-30B Federal specification, ASTM B-3, ASTM B-8 and NY state DOS 16120-880923-2002. UL Listed. Type THHN insulation, rated 90 degrees Celsius, 600 volt. Gray PVC jacket. For applications of direct burial, dwellings not exceeding 3 floors above grade, underground feeder to outdoor lighting or apparatus, exposed or concealed wiring in damp, moist, wet, dry, and corrosive locations, general branch circuit wiring and new wiring or replacement wiring. Flame retardant, moisture, fungus, and corrosion resistant. Sunlight resistant jacket. JC-30B Federal specification, ASTM B-3, ASTM B-8 and NY state DOS 16120-880923-2002. UL Listed. Primarily used in conduit and cable trays for services, feeders, and branch circuits in commercial or industrial applications Thermoplastic insulation maximum 90 degrees Celsius. Moisture, heat, oil and gasoline resistant, 600 volt. Premium grade flame retardant PVC jacket. UL Standard 83, RoHS/REACH Compliant. Can replace TW, THW-RHH and RHW. Thermoplastic PVC maximum 90 degrees Celsius. Moisture, heat, oil and gasoline resistant, 600 volt. Premium grade flame retardant PVC jacket. UL Listed. Can replace TW, THW-RHH and RHW. Thermoplastic PVC maximum 90 degrees Celsius. Moisture, heat, oil and gasoline resistant, 600 volt. Premium grade flame retardant PVC jacket. UL Listed. Can replace TW, THW-RHH and RHW. Thermoplastic PVC maximum 90 degrees Celsius. Moisture, heat, oil and gasoline resistant, 600 volt. Premium grade flame retardant PVC jacket. UL Listed. Can replace TW, THW-RHH and RHW. Thermoplastic PVC maximum 90 degrees Celsius. Moisture, heat, oil and gasoline resistant, 600 volt. Premium grade flame retardant PVC jacket. UL Listed. Can replace TW, THW-RHH and RHW. Thermoplastic PVC maximum 90 degrees Celsius. Moisture, heat, oil and gasoline resistant, 600 volt. Premium grade flame retardant PVC jacket. UL Listed. Inner conductors are type THHN, rated 90 degrees Celsius, 600 volt. Solid strands. Outer jacket is PVC, rated at 75 degrees Celsius. Amp rating of the product is limited to that for 60 degrees Celsius rated conductors per the National Electric Code Article 336. Dwellings not exceeding 3 floors above grade. Exposed or concealed wiring. May be fished through walls, ceilings, and masonry blocks. Use for new wiring or replacement wiring. Only for use in normally dry locations. UL Listed. /2 = 2 insulated wires with bare ground. /3 = 3 insulated wires with bare ground. Inner conductors are type THHN, rated 90 degrees Celsius, 600 volt. Solid strands. Outer jacket is PVC, rated at 75 degrees Celsius. Amp rating of the product is limited to that for 60 degrees Celsius rated conductors per the National Electric Code Article 336. Dwellings not exceeding 3 floors above grade. Exposed or concealed wiring. May be fished through walls, ceilings, and masonry blocks. Use for new wiring or replacement wiring. Only for use in normally dry locations. UL Listed. /2 = 2 insulated wires with bare ground. /3 = 3 insulated wires with bare ground. Pre-installed conductors within an overall protective metallic interlocked armor. 45 percent lighter than steel MC cable. Cable reverse wound for ease of pulling and installation. Conductors - solid bare annealed copper per ASTM B-3, stranded copper stranding per ASTM B-8 for conductor. Conductor insulation rated 90 degree Celsius dry, 75 degrees Celsius wet at 600 volt. Conductor insulation is flame retardant, heat resistant PVC with flame, oil and gasoline resistant nylon jacket. General applications: branch, feeder, and service power distribution in commercial, industrial, institutional, and multi-residential construction/facilities, power, lighting, control, and signal circuits, concealed or exposed installations, installed in raceway/conduit, fished or embedded in plaster, installed in cable tray, and as aerial cable on a messenger. UL Classified 1, 2 and 3 hour through penetration firestop systems: W-L-3110, W-L-3113, W-L-31120, W-L-3121, C-A-J-3115, C-A-J-3140, C-A-J-3142, C-A-J-3202, C-A-J-4065, and C-A-J-4066. UL Listed. Inner conductors are type THHN, rated 90 degrees Celsius, 600 volt. Solid strands. Outer jacket is PVC, rated at 75 degrees Celsius. Amp rating of the product is limited to that for 60 degrees Celsius rated conductors per the National Electric Code Article 336. Dwellings not exceeding 3 floors above grade. Exposed or concealed wiring. May be fished through walls, ceilings, and masonry blocks. Use for new wiring or replacement wiring. Only for use in normally dry locations. UL Listed. /2 = 2 insulated wires with bare ground. /3 = 3 insulated wires with bare ground. Pre-installed conductors within an overall protective metallic interlocked armor. 45 percent lighter than steel MC cable. Cable reverse wound for ease of pulling and installation. Conductors - solid bare annealed copper per ASTM B-3, stranded copper stranding per ASTM B-8 for conductor. Conductor insulation rated 90 degree Celsius dry, 75 degrees Celsius wet at 600 volt. Conductor insulation is flame retardant, heat resistant PVC with flame, oil and gasoline resistant nylon jacket. General applications: branch, feeder, and service power distribution in commercial, industrial, institutional, and multi-residential construction/facilities, power, lighting, control, and signal circuits, concealed or exposed installations, installed in raceway/conduit, fished or embedded in plaster, installed in cable tray, and as aerial cable on a messenger. UL Classified 1, 2 and 3 hour through penetration firestop systems: W-L-3110, W-L-3113, W-L-31120, W-L-3121, C-A-J-3115, C-A-J-3140, C-A-J-3142, C-A-J-3202, C-A-J-4065, and C-A-J-4066. UL Listed. Type THHN insulation, rated 90 degrees Celsius, 600 volt. Gray PVC jacket. For applications of direct burial, dwellings not exceeding 3 floors above grade, underground feeder to outdoor lighting or apparatus, exposed or concealed wiring in damp, moist, wet, dry, and corrosive locations, general branch circuit wiring and new wiring or replacement wiring. Flame retardant, moisture, fungus, and corrosion resistant. Sunlight resistant jacket. JC-30B Federal specification, ASTM B-3, ASTM B-8 and NY state DOS 16120-880923-2002. UL Listed. Type THHN insulation, rated 90 degrees Celsius, 600 volt. Gray PVC jacket. For applications of direct burial, dwellings not exceeding 3 floors above grade, underground feeder to outdoor lighting or apparatus, exposed or concealed wiring in damp, moist, wet, dry, and corrosive locations, general branch circuit wiring and new wiring or replacement wiring. Flame retardant, moisture, fungus, and corrosion resistant. Sunlight resistant jacket. JC-30B Federal specification, ASTM B-3, ASTM B-8 and NY state DOS 16120-880923-2002. UL Listed. Inner conductors are type THHN, rated 90 degrees Celsius, 600 volt. Solid strands. Outer jacket is PVC, rated at 75 degrees Celsius. Amp rating of the product is limited to that for 60 degrees Celsius rated conductors per the National Electric Code Article 336. Dwellings not exceeding 3 floors above grade. Exposed or concealed wiring. May be fished through walls, ceilings, and masonry blocks. Use for new wiring or replacement wiring. Only for use in normally dry locations. UL Listed. /2 = 2 insulated wires with bare ground. /3 = 3 insulated wires with bare ground. Inner conductors are type THHN, rated 90 degrees Celsius, 600 volt. Solid strands. Outer jacket is PVC, rated at 75 degrees Celsius. Amp rating of the product is limited to that for 60 degrees Celsius rated conductors per the National Electric Code Article 336. Dwellings not exceeding 3 floors above grade. Exposed or concealed wiring. May be fished through walls, ceilings, and masonry blocks. Use for new wiring or replacement wiring. Only for use in normally dry locations. UL Listed. /2 = 2 insulated wires with bare ground. /3 = 3 insulated wires with bare ground. Can replace TW, THW-RHH and RHW. Thermoplastic PVC 90 degrees Celsius nylon armored machine tool, building or fixture wire. UL Listed as 90 degrees MYW, 105 degrees CAWM moisture, oil and gasoline resistant. Premium grade flame retardant PVC jacket. Can replace TW, THW-RHH and RHW. Thermoplastic PVC 90 degrees Celsius nylon armored machine tool, building or fixture wire. UL Listed as 90 degrees MYW, 105 degrees CAWM moisture, oil and gasoline resistant. Premium grade flame retardant PVC jacket. Can replace TW, THW-RHH and RHW. Thermoplastic PVC 90 degrees Celsius nylon armored machine tool, building or fixture wire. UL Listed as 90 degrees MYW, 105 degrees CAWM moisture, oil and gasoline resistant. Premium grade flame retardant PVC jacket. Inner conductors are type THHN, rated 90 degrees Celsius, 600 volt. Solid strands. Outer jacket is PVC, rated at 75 degrees Celsius. Amp rating of the product is limited to that for 60 degrees Celsius rated conductors per the National Electric Code Article 336. Dwellings not exceeding 3 floors above grade. Exposed or concealed wiring. May be fished through walls, ceilings, and masonry blocks. Use for new wiring or replacement wiring. Only for use in normally dry locations. UL Listed. /2 = 2 insulated wires with bare ground. /3 = 3 insulated wires with bare ground. Can replace TW, THW-RHH and RHW. Thermoplastic PVC maximum 90 degrees Celsius. Moisture, heat, oil and gasoline resistant, 600 volt. Premium grade flame retardant PVC jacket. UL Listed. Inner conductors are type THHN, rated 90 degrees Celsius, 600 volt. Solid strands. Outer jacket is PVC, rated at 75 degrees Celsius. Amp rating of the product is limited to that for 60 degrees Celsius rated conductors per the National Electric Code Article 336. Dwellings not exceeding 3 floors above grade. Exposed or concealed wiring. May be fished through walls, ceilings, and masonry blocks. Use for new wiring or replacement wiring. Only for use in normally dry locations. UL Listed. /2 = 2 insulated wires with bare ground. /3 = 3 insulated wires with bare ground. Can replace TW, THW-RHH and RHW. Thermoplastic PVC maximum 90 degrees Celsius. Moisture, heat, oil and gasoline resistant, 600 volt. Premium grade flame retardant PVC jacket. UL Listed. Can replace TW, THW-RHH and RHW. Thermoplastic PVC maximum 90 degrees Celsius. Moisture, heat, oil and gasoline resistant, 600 volt. Premium grade flame retardant PVC jacket. UL Listed. Type THHN insulation, rated 90 degrees Celsius, 600 volt. Gray PVC jacket. For applications of direct burial, dwellings not exceeding 3 floors above grade, underground feeder to outdoor lighting or apparatus, exposed or concealed wiring in damp, moist, wet, dry, and corrosive locations, general branch circuit wiring and new wiring or replacement wiring. Flame retardant, moisture, fungus, and corrosion resistant. Sunlight resistant jacket. JC-30B Federal specification, ASTM B-3, ASTM B-8 and NY state DOS 16120-880923-2002. UL Listed. Inner conductors are type THHN, rated 90 degrees Celsius, 600 volt. Solid strands. Outer jacket is PVC, rated at 75 degrees Celsius. Amp rating of the product is limited to that for 60 degrees Celsius rated conductors per the National Electric Code Article 336. Dwellings not exceeding 3 floors above grade. Exposed or concealed wiring. May be fished through walls, ceilings, and masonry blocks. Use for new wiring or replacement wiring. Only for use in normally dry locations. UL Listed. /2 = 2 insulated wires with bare ground. /3 = 3 insulated wires with bare ground. Pre-installed conductors within an overall protective metallic interlocked armor. 45 percent lighter than steel MC cable. Cable reverse wound for ease of pulling and installation. Conductors - solid bare annealed copper per ASTM B-3, stranded copper stranding per ASTM B-8 for conductor. Conductor insulation rated 90 degree Celsius dry, 75 degrees Celsius wet at 600 volt. Conductor insulation is flame retardant, heat resistant PVC with flame, oil and gasoline resistant nylon jacket. General applications: branch, feeder, and service power distribution in commercial, industrial, institutional, and multi-residential construction/facilities, power, lighting, control, and signal circuits, concealed or exposed installations, installed in raceway/conduit, fished or embedded in plaster, installed in cable tray, and as aerial cable on a messenger. UL Classified 1, 2 and 3 hour through penetration firestop systems: W-L-3110, W-L-3113, W-L-31120, W-L-3121, C-A-J-3115, C-A-J-3140, C-A-J-3142, C-A-J-3202, C-A-J-4065, and C-A-J-4066. UL Listed. Inner conductors are type THHN, rated 90 degrees Celsius, 600 volt. Solid strands. Outer jacket is PVC, rated at 75 degrees Celsius. Amp rating of the product is limited to that for 60 degrees Celsius rated conductors per the National Electric Code Article 336. Dwellings not exceeding 3 floors above grade. Exposed or concealed wiring. May be fished through walls, ceilings, and masonry blocks. Use for new wiring or replacement wiring. Only for use in normally dry locations. UL Listed. /2 = 2 insulated wires with bare ground. /3 = 3 insulated wires with bare ground. Parallel wire, power limited circuit cable, -20 Celsius to 105 Celsius. Used for stereos and hi-fi systems, home theater sound systems, lamps, and radios. Soft annealed copper per ASTM B3-90 conductor and PVC. UL Type CL2, UL1581 and UL13 approved. Clear jacket, on a spool. Can replace TW, THW-RHH and RHW. Thermoplastic PVC 90 degrees Celsius nylon armored machine tool, building or fixture wire. UL Listed as 90 degrees MYW, 105 degrees CAWM moisture, oil and gasoline resistant. Premium grade flame retardant PVC jacket. BaronStat Thermostat Wire, 20 AWG Conductor, 2 Conductors, Bare Copper Conductor, 500 ft Reel Length, Solid Strands, 0.144 in Outside Diameter, 150 VAC, Polypropylene Insulation, PVC Jacket, Brown Jacket, -20 TO 60 deg C, 10.73 Ohm, UL, CETL Listed, For Thermostat Control Applications Type THHN insulation, rated 90 degrees Celsius, 600 volt. Gray PVC jacket. For applications of direct burial, dwellings not exceeding 3 floors above grade, underground feeder to outdoor lighting or apparatus, exposed or concealed wiring in damp, moist, wet, dry, and corrosive locations, general branch circuit wiring and new wiring or replacement wiring. Flame retardant, moisture, fungus, and corrosion resistant. Sunlight resistant jacket. JC-30B Federal specification, ASTM B-3, ASTM B-8 and NY state DOS 16120-880923-2002. UL Listed. Constructed with soft-drawn copper, type THHN insulated conductors which are individually wrapped with a moisture-resistant, flame-retardant paper covering. Interlocking steel armor is applied over the assembly. A 16 AWG aluminum bond wire is placed inside the armor, runs longitudinally and is in intimate contact with the armor for its entire length. General applications: Dry locations only, branch, feeder, and service power distribution in commercial, industrial, institutional, and multi-residential buildings, power, lighting, control and signal circuits, concealed or exposed installations, installed in cable tray and approved raceways, environmental air-handling spaces per NEC and under raised floors for information technology equipment conductors and cables per NEC 645.5(D) & 645.5(D)(2). 300.22(C), fished or embedded in plaster. Meets or exceeds the requirements of UL Standard 4 for Armored Cable, UL Standard 83, Federal Specification A-A59544 (formerly J-C-30B), and the National Electrical Code. Listed for use in UL 1, 2, and 3 hour through-penetration firestop systems. Premium grade flame retardant PVC jacket. Rated maximum 90 degrees Celsius dry and damp, 600 volt. General purpose building wire for services, feeders and branch circuits. Resistant to abrasion, acids, alkalines, ozone, and water. 500' spool. UL Listed. Premium grade flame retardant PVC jacket. Rated maximum 90 degrees Celsius dry and damp, 600 volt. General purpose building wire for services, feeders and branch circuits. Resistant to abrasion, acids, alkalines, ozone, and water. 500' spool. UL Listed. Premium grade flame retardant PVC jacket. Rated maximum 90 degrees Celsius dry and damp, 600 volt. General purpose building wire for services, feeders and branch circuits. Resistant to abrasion, acids, alkalines, ozone, and water. 500' spool. UL Listed. Premium grade flame retardant PVC jacket. Rated maximum 90 degrees Celsius dry and damp, 600 volt. General purpose building wire for services, feeders and branch circuits. Resistant to abrasion, acids, alkalines, ozone, and water. 500' spool. UL Listed. Premium grade flame retardant PVC jacket. Rated maximum 90 degrees Celsius dry and damp, 600 volt. General purpose building wire for services, feeders and branch circuits. Resistant to abrasion, acids, alkalines, ozone, and water. 500' spool. UL Listed. Thermoplastic PVC jacket, not for hard usage in accordance with NEC. Used for lamps, small appliances and radios. Soft annealed stranded copper per ASTM B3-90 conductor. 300 volt maximum. PVC insulation and UL62, UL1581 Listed. Spool. Thermoplastic PVC jacket, not for hard usage in accordance with NEC. Used for lamps, small appliances and radios. Soft annealed stranded copper per ASTM B3-90 conductor. 300 volt maximum. PVC insulation and UL62, UL1581 Listed. Spool. Inner conductors are type THHN, rated 90 degrees Celsius, 600 volt. Solid strands. Outer jacket is PVC, rated at 75 degrees Celsius. Amp rating of the product is limited to that for 60 degrees Celsius rated conductors per the National Electric Code Article 336. Dwellings not exceeding 3 floors above grade. Exposed or concealed wiring. May be fished through walls, ceilings, and masonry blocks. Use for new wiring or replacement wiring. Only for use in normally dry locations. UL Listed. /2 = 2 insulated wires with bare ground. /3 = 3 insulated wires with bare ground. Thermoplastic PVC jacket, not for hard usage in accordance with NEC. Used for lamps, small appliances and radios. Soft annealed stranded copper per ASTM B3-90 conductor. 300 volt maximum. PVC insulation and UL62, UL1581 Listed. Spool. Thermoplastic PVC jacket, not for hard usage in accordance with NEC. Used for lamps, small appliances and radios. Soft annealed stranded copper per ASTM B3-90 conductor. 300 volt maximum. PVC insulation and UL62, UL1581 Listed. Spool. Type THHN insulation, rated 90 degrees Celsius, 600 volt. Gray PVC jacket. For applications of direct burial, dwellings not exceeding 3 floors above grade, underground feeder to outdoor lighting or apparatus, exposed or concealed wiring in damp, moist, wet, dry, and corrosive locations, general branch circuit wiring and new wiring or replacement wiring. Flame retardant, moisture, fungus, and corrosion resistant. Sunlight resistant jacket. JC-30B Federal specification, ASTM B-3, ASTM B-8 and NY state DOS 16120-880923-2002. UL Listed. Annealed (soft) copper conductor cable, with a ground wire, primarily used in residential wiring as branch circuits for outlets, switches, and other loads. May be used for both exposed and concealed work in normally dry locations at temperatures not to exceed 90 degrees C (with ampacity limited to that for 60 degree C conductors) as specified in the National Electrical Code 1. May be run in air voids of masonry block or tile walls where such walls are not subject to excessive moisture or dampness. Voltage rating for NM-B cable is 600 volts. Meets or exceeds UL Standard 83, UL Standard 719, Federal Specification A-A-59544, and requirements of the National Electrical Code. Conductor 18 AWG soft annealed solid copper per ASTM B3-90. PVC thermostatic insulation, temperature 60 degrees Celsius. Used for thermostat controls, heating and air conditioning installations, burglar alarm systems, intercom systems and doorbells. Type CL2, 150 volts. PVC insulation UL13 for power limited circuit cable for other than plenum, riser, or tray uses and UL1581 approved. Parallel wire, power limited circuit cable, -20 Celsius to 105 Celsius. Used for stereos and hi-fi systems, home theater sound systems, lamps, and radios. Soft annealed copper per ASTM B3-90 conductor and PVC. UL Type CL2, UL1581 and UL13 approved. Clear jacket, on a spool. Thermoplastic PVC jacket, not for hard usage in accordance with NEC. Used for lamps, small appliances and radios. Soft annealed stranded copper per ASTM B3-90 conductor. 300 volt maximum. PVC insulation and UL62, UL1581 Listed. Spool. Type THHN insulation, rated 90 degrees Celsius, 600 volt. Gray PVC jacket. For applications of direct burial, dwellings not exceeding 3 floors above grade, underground feeder to outdoor lighting or apparatus, exposed or concealed wiring in damp, moist, wet, dry, and corrosive locations, general branch circuit wiring and new wiring or replacement wiring. Flame retardant, moisture, fungus, and corrosion resistant. Sunlight resistant jacket. JC-30B Federal specification, ASTM B-3, ASTM B-8 and NY state DOS 16120-880923-2002. UL Listed. Inner conductors are type THHN, rated 90 degrees Celsius, 600 volt. Solid strands. Outer jacket is PVC, rated at 75 degrees Celsius. Amp rating of the product is limited to that for 60 degrees Celsius rated conductors per the National Electric Code Article 336. Dwellings not exceeding 3 floors above grade. Exposed or concealed wiring. May be fished through walls, ceilings, and masonry blocks. Use for new wiring or replacement wiring. Only for use in normally dry locations. UL Listed. /2 = 2 insulated wires with bare ground. /3 = 3 insulated wires with bare ground. Conductor 18 AWG soft annealed solid copper per ASTM B3-90. PVC thermostatic insulation, temperature 60 degrees Celsius. Used for thermostat controls, heating and air conditioning installations, burglar alarm systems, intercom systems and doorbells. Type CL2, 150 volts. PVC insulation UL13 for power limited circuit cable for other than plenum, riser, or tray uses and UL1581 approved. Thermoplastic PVC jacket, not for hard usage in accordance with NEC. Used for lamps, small appliances and radios. Soft annealed stranded copper per ASTM B3-90 conductor. 300 volt maximum. PVC insulation and UL62, UL1581 Listed. Spool. Thermoplastic insulated conductors and jacket. Used for portable tools and lights. Soft annealed stranded copper conductor. Weather resistant PVC jacket. Orange, 250 foot spool. UL62, UL1581 and CSA approved. 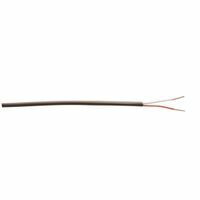 Conductor 18 AWG soft annealed solid copper per ASTM B3-90. PVC thermostatic insulation, temperature 60 degrees Celsius. Used for thermostat controls, heating and air conditioning installations, burglar alarm systems, intercom systems and doorbells. Type CL2, 150 volts. PVC insulation UL13 for power limited circuit cable for other than plenum, riser, or tray uses and UL1581 approved. Premium grade flame retardant PVC jacket. Rated maximum 90 degrees Celsius dry and damp, 600 volt. General purpose building wire for services, feeders and branch circuits. Resistant to abrasion, acids, alkalines, ozone, and water. 500' spool. UL Listed. Premium grade flame retardant PVC jacket. Rated maximum 90 degrees Celsius dry and damp, 600 volt. General purpose building wire for services, feeders and branch circuits. Resistant to abrasion, acids, alkalines, ozone, and water. 500' spool. UL Listed. Premium grade flame retardant PVC jacket. Rated maximum 90 degrees Celsius dry and damp, 600 volt. General purpose building wire for services, feeders and branch circuits. Resistant to abrasion, acids, alkalines, ozone, and water. 500' spool. UL Listed. Premium grade flame retardant PVC jacket. Rated maximum 90 degrees Celsius dry and damp, 600 volt. General purpose building wire for services, feeders and branch circuits. Resistant to abrasion, acids, alkalines, ozone, and water. 500' spool. UL Listed. Pre-installed conductors within an overall protective metallic interlocked armor. 45 percent lighter than steel MC cable. Cable reverse wound for ease of pulling and installation. Conductors - solid bare annealed copper per ASTM B-3, stranded copper stranding per ASTM B-8 for conductor. Conductor insulation rated 90 degree Celsius dry, 75 degrees Celsius wet at 600 volt. Conductor insulation is flame retardant, heat resistant PVC with flame, oil and gasoline resistant nylon jacket. General applications: branch, feeder, and service power distribution in commercial, industrial, institutional, and multi-residential construction/facilities, power, lighting, control, and signal circuits, concealed or exposed installations, installed in raceway/conduit, fished or embedded in plaster, installed in cable tray, and as aerial cable on a messenger. UL Classified 1, 2 and 3 hour through penetration firestop systems: W-L-3110, W-L-3113, W-L-31120, W-L-3121, C-A-J-3115, C-A-J-3140, C-A-J-3142, C-A-J-3202, C-A-J-4065, and C-A-J-4066. UL Listed. Inner conductors are type THHN, rated 90 degrees Celsius, 600 volt. Solid strands. Outer jacket is PVC, rated at 75 degrees Celsius. Amp rating of the product is limited to that for 60 degrees Celsius rated conductors per the National Electric Code Article 336. Dwellings not exceeding 3 floors above grade. Exposed or concealed wiring. May be fished through walls, ceilings, and masonry blocks. Use for new wiring or replacement wiring. Only for use in normally dry locations. UL Listed. /2 = 2 insulated wires with bare ground. /3 = 3 insulated wires with bare ground. Annealed (soft) copper conductor cable, with a ground wire, primarily used in residential wiring as branch circuits for outlets, switches, and other loads. May be used for both exposed and concealed work in normally dry locations at temperatures not to exceed 90 degrees C (with ampacity limited to that for 60 degree C conductors) as specified in the National Electrical Code 1. May be run in air voids of masonry block or tile walls where such walls are not subject to excessive moisture or dampness. Voltage rating for NM-B cable is 600 volts. Meets or exceeds UL Standard 83, UL Standard 719, Federal Specification A-A-59544, and requirements of the National Electrical Code. Annealed (soft) copper conductor cable, with a ground wire, primarily used in residential wiring as branch circuits for outlets, switches, and other loads. May be used for both exposed and concealed work in normally dry locations at temperatures not to exceed 90 degrees C (with ampacity limited to that for 60 degree C conductors) as specified in the National Electrical Code 1. May be run in air voids of masonry block or tile walls where such walls are not subject to excessive moisture or dampness. Voltage rating for NM-B cable is 600 volts. Meets or exceeds UL Standard 83, UL Standard 719, Federal Specification A-A-59544, and requirements of the National Electrical Code. Inner conductors are type THHN, rated 90 degrees Celsius, 600 volt. Solid strands. Outer jacket is PVC, rated at 75 degrees Celsius. Amp rating of the product is limited to that for 60 degrees Celsius rated conductors per the National Electric Code Article 336. Dwellings not exceeding 3 floors above grade. Exposed or concealed wiring. May be fished through walls, ceilings, and masonry blocks. Use for new wiring or replacement wiring. Only for use in normally dry locations. UL Listed. /2 = 2 insulated wires with bare ground. /3 = 3 insulated wires with bare ground. Thermoplastic insulated conductors and jacket. Used for portable tools and lights. Soft annealed stranded copper conductor. Weather resistant PVC jacket. Orange, 250 foot spool. UL62, UL1581 and CSA approved. Parallel wire, power limited circuit cable, -20 Celsius to 105 Celsius. Used for stereos and hi-fi systems, home theater sound systems, lamps, and radios. Soft annealed copper per ASTM B3-90 conductor and PVC. UL Type CL2, UL1581 and UL13 approved. Clear jacket, on a spool. Inner conductors are type THHN, rated 90 degrees Celsius, 600 volt. Solid strands. Outer jacket is PVC, rated at 75 degrees Celsius. Amp rating of the product is limited to that for 60 degrees Celsius rated conductors per the National Electric Code Article 336. Dwellings not exceeding 3 floors above grade. Exposed or concealed wiring. May be fished through walls, ceilings, and masonry blocks. Use for new wiring or replacement wiring. Only for use in normally dry locations. UL Listed. /2 = 2 insulated wires with bare ground. /3 = 3 insulated wires with bare ground. 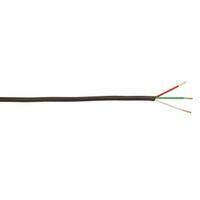 Conductor 18 AWG soft annealed solid copper per ASTM B3-90. PVC thermostatic insulation, temperature 60 degrees Celsius. Used for thermostat controls, heating and air conditioning installations, burglar alarm systems, intercom systems and doorbells. Type CL2, 150 volts. PVC insulation UL13 for power limited circuit cable for other than plenum, riser, or tray uses and UL1581 approved. Two bare copper conductors laid flat with integral PVC insulation and jacket. Clear jacket construction has one bare copper and one tinned copper conductor. Temperature rated from -20 to 60 degrees C, operating voltage 300 volts maximum. 18/2 stranded, flat, boxed. UL Standard 13 & 444, CSA C22.2 No. 214, NEC Article 725 & 800.. Inner conductors are type THHN, rated 90 degrees Celsius, 600 volt. Solid strands. Outer jacket is PVC, rated at 75 degrees Celsius. Amp rating of the product is limited to that for 60 degrees Celsius rated conductors per the National Electric Code Article 336. Dwellings not exceeding 3 floors above grade. Exposed or concealed wiring. May be fished through walls, ceilings, and masonry blocks. Use for new wiring or replacement wiring. Only for use in normally dry locations. UL Listed. /2 = 2 insulated wires with bare ground. /3 = 3 insulated wires with bare ground. Equipment and circuit grounding. Equipment and circuit grounding. Flexible and easily shaped, formed, welded and soldered into place. Use in overhead transmission and distribution systems and for grounding grid systems. Type THHN insulation, rated 90 degrees Celsius, 600 volt. Gray PVC jacket. For applications of direct burial, dwellings not exceeding 3 floors above grade, underground feeder to outdoor lighting or apparatus, exposed or concealed wiring in damp, moist, wet, dry, and corrosive locations, general branch circuit wiring and new wiring or replacement wiring. Flame retardant, moisture, fungus, and corrosion resistant. Sunlight resistant jacket. JC-30B Federal specification, ASTM B-3, ASTM B-8 and NY state DOS 16120-880923-2002. UL Listed. Equipment and circuit grounding. ETL Listed type CL2 power limited circuit cable is a general-purpose 8 conductor low voltage control cable. Construction provides solid uncoated copper conductors insulated with polyvinyl chloride (PVC) insulation twisted together without filler and covered with an ETL listed sunlight resistant PVC jacket. Conductor colors are red, white, green, blue, yellow, brown, orange and black. Used for air conditioning controls, heat pumps, heating controls, thermostats and bell and alarm systems. For use in accordance with the NEC Article 725. Rated 60 degrees Celsius continuous in air. Solid 18/8 type CL2. Meets UL 1581 vertical flame tray test. 15 mil jacket thickness, approximately 202 mil overall cable diameter. Type CL2 low voltage cable using thermoplastic insulated solid conductors. Resistant to the spread of fire in accordance with NEC. Not for riser, plenum, or tray uses and 60 degrees Celsius. Use for thermostat control, burglar alarms, intercoms and doorbells. Soft annealed solid copper per ASTM B3-90 conductor. PVC insulation and UL13 approved for power limited circuit cable for other than plenum, riser, or tray uses. 150 volt. Annealed (soft) copper conductor cable, with a ground wire, primarily used in residential wiring as branch circuits for outlets, switches, and other loads. May be used for both exposed and concealed work in normally dry locations at temperatures not to exceed 90 degrees C (with ampacity limited to that for 60 degree C conductors) as specified in the National Electrical Code 1. May be run in air voids of masonry block or tile walls where such walls are not subject to excessive moisture or dampness. Voltage rating for NM-B cable is 600 volts. Meets or exceeds UL Standard 83, UL Standard 719, Federal Specification A-A-59544, and requirements of the National Electrical Code. Thermoplastic insulated conductors and jacket. Used for portable tools and lights. Soft annealed stranded copper conductor. Weather resistant PVC jacket. Orange, 250 foot spool. UL62, UL1581 and CSA approved. Inner conductors are type THHN, rated 90 degrees Celsius, 600 volt. Solid strands. Outer jacket is PVC, rated at 75 degrees Celsius. Amp rating of the product is limited to that for 60 degrees Celsius rated conductors per the National Electric Code Article 336. Dwellings not exceeding 3 floors above grade. Exposed or concealed wiring. May be fished through walls, ceilings, and masonry blocks. Use for new wiring or replacement wiring. Only for use in normally dry locations. UL Listed. /2 = 2 insulated wires with bare ground. /3 = 3 insulated wires with bare ground. Thermoplastic PVC jacketed parallel constructed service cord. Not for hard usage in accordance with NEC. Used for outdoor low voltage lighting systems. Soft annealed stranded cooper per ASTM B3-90 conductor. UL13 approved. Flexible and easily shaped, formed, welded and soldered into place. Use in overhead transmission and distribution systems and for grounding grid systems. Southwire Flexible Cord, SJEW, Series: Quantum, 18 AWG Conductor, 2 Conductors, Bare Copper Conductor, 250 ft Length, 16/30 Strands, 0.29 in Outside Diameter, 300 V, TPE Insulation, TPE Jacket, Black/White Jacket, -50 TO 105 deg C, CSA Certified, Federal Specification J-C-580B, NEC Article 400, OSHA Approved, RoHS Complaint, Oil Resist, Motor Equipment and circuit grounding. Equipment and circuit grounding. Annealed (soft) copper conductor cable, with a ground wire, primarily used in residential wiring as branch circuits for outlets, switches, and other loads. May be used for both exposed and concealed work in normally dry locations at temperatures not to exceed 90 degrees C (with ampacity limited to that for 60 degree C conductors) as specified in the National Electrical Code 1. May be run in air voids of masonry block or tile walls where such walls are not subject to excessive moisture or dampness. Voltage rating for NM-B cable is 600 volts. Meets or exceeds UL Standard 83, UL Standard 719, Federal Specification A-A-59544, and requirements of the National Electrical Code. Premium grade flame retardant PVC jacket. Rated maximum 90 degrees Celsius dry and damp, 600 volt. General purpose building wire for services, feeders and branch circuits. Resistant to abrasion, acids, alkalines, ozone, and water. 500' spool. UL Listed. Conductor 18 AWG soft annealed solid copper per ASTM B3-90. PVC thermostatic insulation, temperature 60 degrees Celsius. Used for thermostat controls, heating and air conditioning installations, burglar alarm systems, intercom systems and doorbells. Type CL2, 150 volts. PVC insulation UL13 for power limited circuit cable for other than plenum, riser, or tray uses and UL1581 approved. Annealed (soft) copper conductor cable, with a ground wire, primarily used in residential wiring as branch circuits for outlets, switches, and other loads. May be used for both exposed and concealed work in normally dry locations at temperatures not to exceed 90 degrees C (with ampacity limited to that for 60 degree C conductors) as specified in the National Electrical Code 1. May be run in air voids of masonry block or tile walls where such walls are not subject to excessive moisture or dampness. Voltage rating for NM-B cable is 600 volts. Meets or exceeds UL Standard 83, UL Standard 719, Federal Specification A-A-59544, and requirements of the National Electrical Code. Type THHN insulation, rated 90 degrees Celsius, 600 volt. Gray PVC jacket. For applications of direct burial, dwellings not exceeding 3 floors above grade, underground feeder to outdoor lighting or apparatus, exposed or concealed wiring in damp, moist, wet, dry, and corrosive locations, general branch circuit wiring and new wiring or replacement wiring. Flame retardant, moisture, fungus, and corrosion resistant. Sunlight resistant jacket. JC-30B Federal specification, ASTM B-3, ASTM B-8 and NY state DOS 16120-880923-2002. UL Listed. Inner conductors are type THHN, rated 90 degrees Celsius, 600 volt. Solid strands. Outer jacket is PVC, rated at 75 degrees Celsius. Amp rating of the product is limited to that for 60 degrees Celsius rated conductors per the National Electric Code Article 336. Dwellings not exceeding 3 floors above grade. Exposed or concealed wiring. May be fished through walls, ceilings, and masonry blocks. Use for new wiring or replacement wiring. Only for use in normally dry locations. UL Listed. /2 = 2 insulated wires with bare ground. /3 = 3 insulated wires with bare ground. For hard usage applications in accordance with NEC. Flexible and tough jacket. Temperature range of -50 to 105 degrees C. Used for portable tools and lamps, pumps, portable farm equipment. Soft annealed stranded copper per ASTM B3-90 conductor. TPE insulation. UL62, UL1581 and CSA-C22.2 No.49 approved. Thermoplastic insulated conductors and jacket. Used for portable tools and lights. Soft annealed stranded copper conductor. Weather resistant PVC jacket. Orange, 250 foot spool. UL62, UL1581 and CSA approved. For hard usage applications in accordance with NEC. Used with portable tools and lamps, pumps, portable farm equipment. Soft annealed stranded copper per ASTM B3-90. Black TPE insulation and jacket. UL62, UL1581, CSA approved. Type CL2 low voltage cable using thermoplastic insulated solid conductors. Resistant to the spread of fire in accordance with NEC. Not for riser, plenum, or tray uses and 60 degrees Celsius. Use for thermostat control, burglar alarms, intercoms and doorbells. Soft annealed solid copper per ASTM B3-90 conductor. PVC insulation and UL13 approved for power limited circuit cable for other than plenum, riser, or tray uses. 150 volt. Inner conductors are type THHN, rated 90 degrees Celsius, 600 volt. Solid strands. Outer jacket is PVC, rated at 75 degrees Celsius. Amp rating of the product is limited to that for 60 degrees Celsius rated conductors per the National Electric Code Article 336. Dwellings not exceeding 3 floors above grade. Exposed or concealed wiring. May be fished through walls, ceilings, and masonry blocks. Use for new wiring or replacement wiring. Only for use in normally dry locations. UL Listed. /2 = 2 insulated wires with bare ground. /3 = 3 insulated wires with bare ground. Annealed (soft) copper conductor cable, with a ground wire, primarily used in residential wiring as branch circuits for outlets, switches, and other loads. May be used for both exposed and concealed work in normally dry locations at temperatures not to exceed 90 degrees C (with ampacity limited to that for 60 degree C conductors) as specified in the National Electrical Code 1. May be run in air voids of masonry block or tile walls where such walls are not subject to excessive moisture or dampness. Voltage rating for NM-B cable is 600 volts. Meets or exceeds UL Standard 83, UL Standard 719, Federal Specification A-A-59544, and requirements of the National Electrical Code. Annealed (soft) copper conductor cable, with a ground wire, primarily used in residential wiring as branch circuits for outlets, switches, and other loads. May be used for both exposed and concealed work in normally dry locations at temperatures not to exceed 90 degrees C (with ampacity limited to that for 60 degree C conductors) as specified in the National Electrical Code 1. May be run in air voids of masonry block or tile walls where such walls are not subject to excessive moisture or dampness. Voltage rating for NM-B cable is 600 volts. Meets or exceeds UL Standard 83, UL Standard 719, Federal Specification A-A-59544, and requirements of the National Electrical Code. Underground sprinkler system wire. 18/7 solid, 30 volts RMS max. Used for sprinkler control systems. Soft annealed solid copper per ASTM B3-90. Polyethylene insulation and jacket. 18 AWG bare copper. Cable consists of 7 bare copper insulated conductors with an overall outer jacket diameter of 0.268; UL listed. Type THHN insulation, rated 90 degrees Celsius, 600 volt. Gray PVC jacket. For applications of direct burial, dwellings not exceeding 3 floors above grade, underground feeder to outdoor lighting or apparatus, exposed or concealed wiring in damp, moist, wet, dry, and corrosive locations, general branch circuit wiring and new wiring or replacement wiring. Flame retardant, moisture, fungus, and corrosion resistant. Sunlight resistant jacket. JC-30B Federal specification, ASTM B-3, ASTM B-8 and NY state DOS 16120-880923-2002. UL Listed. Hard service thermoplastic insulated conductors and overall thermoplastic jacket. All elastomer construction. Conductor is soft annealed stranded copper per ASTM B3-90. Temperature range from -50 degrees Celsius to +105 degrees Celsius. For hard usage applications in accordance with NEC and for use with portable tools and lamps, pumps and portable farm equipment. Weather resistant. 300 volt - 250' spool. UL 62, UL1581, CSA-C22.2 No. 49. For hard usage applications in accordance with NEC. Flexible and tough jacket. Temperature range of -50 to 105 degrees C. Used for portable tools and lamps, pumps, portable farm equipment. Soft annealed stranded copper per ASTM B3-90 conductor. TPE insulation. UL62, UL1581 and CSA-C22.2 No.49 approved. Cross-linked polyethylene (XLPE) insulation. Insulated conductors laid parallel with bare ground wires helically wound around core. Covered with a reinforced binder tape. Sunlight resistant gray PVC jacket. Above ground service entrance and branch circuit. Maximum operating temperature of phase conductors not to exceed 90 degrees Celsius in wet or dry locations, 600 volt. UL Listed. Amp capacities listed are at 30 degrees Celsius/85 degrees Fahrenheit. 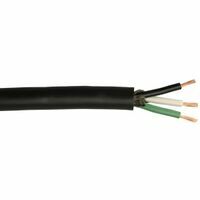 Southwire Sprinkler Wire, Direct Burial, 18 AWG Conductor, 5 Conductors, Copper Conductor, 500 ft Length, 0.24 in Outside Diameter, 30 VAC, PVC Insulation, Polyethylene Jacket, Black Jacket, 60 deg C, UL Listed, For Use With field and Central Controls in underground sprinkler Systems Premium grade flame retardant PVC jacket. Rated maximum 90 degrees Celsius dry and damp, 600 volt. General purpose building wire for services, feeders and branch circuits. Resistant to abrasion, acids, alkalines, ozone, and water. 500' spool. UL Listed. Premium grade flame retardant PVC jacket. Rated maximum 90 degrees Celsius dry and damp, 600 volt. General purpose building wire for services, feeders and branch circuits. Resistant to abrasion, acids, alkalines, ozone, and water. 500' spool. UL Listed. For hard usage applications in accordance with NEC. Used with portable tools and lamps, pumps, portable farm equipment. Soft annealed stranded copper per ASTM B3-90. Black TPE insulation and jacket. UL62, UL1581, CSA approved. For hard usage applications in accordance with NEC. Used with portable tools and lamps, pumps, portable farm equipment. Soft annealed stranded copper per ASTM B3-90. Black TPE insulation and jacket. UL62, UL1581, CSA approved. Type THHN insulation, rated 90 degrees Celsius, 600 volt. Gray PVC jacket. For applications of direct burial, dwellings not exceeding 3 floors above grade, underground feeder to outdoor lighting or apparatus, exposed or concealed wiring in damp, moist, wet, dry, and corrosive locations, general branch circuit wiring and new wiring or replacement wiring. Flame retardant, moisture, fungus, and corrosion resistant. Sunlight resistant jacket. JC-30B Federal specification, ASTM B-3, ASTM B-8 and NY state DOS 16120-880923-2002. UL Listed. Extra hard usage per NEC. Used for garages, portable tools and lights, battery chargers. Weather resistant for outdoor applications, dishwashers and refrigerators. Resists most acids 10 AWG through 14 AWG, 60 degrees Celsius to 105 degrees Celsius. Soft annealed stranded copper per ASTM B3-90 conductor. TPE class 36, rubber insulation. TPE weather resistant class 36, black rubber jacket. UL 62, UL1581, CSA approved. Black, 250' spool. Type THHN insulation, rated 90 degrees Celsius, 600 volt. Gray PVC jacket. For applications of direct burial, dwellings not exceeding 3 floors above grade, underground feeder to outdoor lighting or apparatus, exposed or concealed wiring in damp, moist, wet, dry, and corrosive locations, general branch circuit wiring and new wiring or replacement wiring. Flame retardant, moisture, fungus, and corrosion resistant. Sunlight resistant jacket. JC-30B Federal specification, ASTM B-3, ASTM B-8 and NY state DOS 16120-880923-2002. UL Listed. Thermoplastic PVC jacketed parallel constructed service cord. Not for hard usage in accordance with NEC. Used for outdoor low voltage lighting systems. Soft annealed stranded cooper per ASTM B3-90 conductor. UL13 approved. Annealed (soft) copper conductor cable, with a ground wire, primarily used in residential wiring as branch circuits for outlets, switches, and other loads. May be used for both exposed and concealed work in normally dry locations at temperatures not to exceed 90 degrees C (with ampacity limited to that for 60 degree C conductors) as specified in the National Electrical Code 1. May be run in air voids of masonry block or tile walls where such walls are not subject to excessive moisture or dampness. Voltage rating for NM-B cable is 600 volts. 3 conductors, 1,000 foot spool. Meets or exceeds UL Standard 83, UL Standard 719, Federal Specification A-A-59544, and requirements of the National Electrical Code. Type THHN insulation, rated 90 degrees Celsius, 600 volt. Gray PVC jacket. For applications of direct burial, dwellings not exceeding 3 floors above grade, underground feeder to outdoor lighting or apparatus, exposed or concealed wiring in damp, moist, wet, dry, and corrosive locations, general branch circuit wiring and new wiring or replacement wiring. Flame retardant, moisture, fungus, and corrosion resistant. Sunlight resistant jacket. JC-30B Federal specification, ASTM B-3, ASTM B-8 and NY state DOS 16120-880923-2002. UL Listed. Extra hard usage per NEC. Used for garages, portable tools and lights, battery chargers. Weather resistant for outdoor applications, dishwashers and refrigerators. Resists most acids 10 AWG through 14 AWG, 60 degrees Celsius to 105 degrees Celsius. Soft annealed stranded copper per ASTM B3-90 conductor. TPE class 36, rubber insulation. TPE weather resistant class 36, black rubber jacket. UL 62, UL1581, CSA approved. Black, 250' spool. Annealed (soft) copper conductor cable, with a ground wire, primarily used in residential wiring as branch circuits for outlets, switches, and other loads. May be used for both exposed and concealed work in normally dry locations at temperatures not to exceed 90 degrees C (with ampacity limited to that for 60 degree C conductors) as specified in the National Electrical Code 1. May be run in air voids of masonry block or tile walls where such walls are not subject to excessive moisture or dampness. Voltage rating for NM-B cable is 600 volts. 3 conductors, 1,000 foot spool. Meets or exceeds UL Standard 83, UL Standard 719, Federal Specification A-A-59544, and requirements of the National Electrical Code. For hard usage applications in accordance with NEC. Used with portable tools and lamps, pumps, portable farm equipment. Soft annealed stranded copper per ASTM B3-90. Black TPE insulation and jacket. UL62, UL1581, CSA approved. Inner conductors are type THHN, rated 90 degrees Celsius, 600 volt. Solid strands. Outer jacket is PVC, rated at 75 degrees Celsius. Amp rating of the product is limited to that for 60 degrees Celsius rated conductors per the National Electric Code Article 336. Dwellings not exceeding 3 floors above grade. Exposed or concealed wiring. May be fished through walls, ceilings, and masonry blocks. Use for new wiring or replacement wiring. Only for use in normally dry locations. UL Listed. /2 = 2 insulated wires with bare ground. /3 = 3 insulated wires with bare ground. Extra hard usage per NEC. Used for garages, portable tools and lights, battery chargers. Weather resistant for outdoor applications, dishwashers and refrigerators. Resists most acids 10 AWG through 14 AWG, 60 degrees Celsius to 105 degrees Celsius. Soft annealed stranded copper per ASTM B3-90 conductor. TPE class 36, rubber insulation. TPE weather resistant class 36, black rubber jacket. UL 62, UL1581, CSA approved. Black, 250' spool. Extra hard usage per NEC. Used for garages, portable tools and lights, battery chargers. Weather resistant for outdoor applications, dishwashers and refrigerators. Soft annealed stranded copper. TPE weather resistant class 36, black rubber jacket. UL 62, UL1581, CSA approved. Black, 250' spool. Extra hard usage per NEC. Used for garages, portable tools and lights, battery chargers. Weather resistant for outdoor applications, dishwashers and refrigerators. Resists most acids 10 AWG through 14 AWG, 60 degrees Celsius to 105 degrees Celsius. Soft annealed stranded copper per ASTM B3-90 conductor. TPE class 36, rubber insulation. TPE weather resistant class 36, black rubber jacket. UL 62, UL1581, CSA approved. Black, 250' spool. Premium grade flame retardant PVC jacket. Rated maximum 90 degrees Celsius dry and damp, 600 volt. General purpose building wire for services, feeders and branch circuits. Resistant to abrasion, acids, alkalines, ozone, and water. 500' spool. UL Listed. Premium grade flame retardant PVC jacket. Rated maximum 90 degrees Celsius dry and damp, 600 volt. General purpose building wire for services, feeders and branch circuits. Resistant to abrasion, acids, alkalines, ozone, and water. 500' spool. UL Listed. Inner conductors are type THHN, rated 90 degrees Celsius, 600 volt. Solid strands. Outer jacket is PVC, rated at 75 degrees Celsius. Amp rating of the product is limited to that for 60 degrees Celsius rated conductors per the National Electric Code Article 336. Dwellings not exceeding 3 floors above grade. Exposed or concealed wiring. May be fished through walls, ceilings, and masonry blocks. Use for new wiring or replacement wiring. Only for use in normally dry locations. UL Listed. /2 = 2 insulated wires with bare ground. /3 = 3 insulated wires with bare ground. CCI Electrical Wire, Portable, SEOOW, 10 AWG Conductor, 4 Conductors, Bare Copper Conductor, 250 ft Length, 104/30 Strands, 0.702 in Outside Diameter, 30 A, 600 V, TPE Insulation, TPE Jacket, Black Jacket, -50 TO 105 deg C, CSA 22.2 NO 49, Federal Spec NO JC580B, NEC 501.140, RoHS Complaint, 301 lb/kft, Chemical Resist, For Heavy Machine Tools Premium grade flame retardant black PVC jacket. Rated maximum 90 degrees Celsius dry and damp, 600 volt. General purpose building wire for services, feeders and branch circuits. Resistant to abrasion, acids, alkalines, ozone, and water. UL Listed. Annealed (soft) copper conductor cable, with a ground wire, primarily used in residential wiring as branch circuits for outlets, switches, and other loads. May be used for both exposed and concealed work in normally dry locations at temperatures not to exceed 90 degrees C (with ampacity limited to that for 60 degree C conductors) as specified in the National Electrical Code 1. May be run in air voids of masonry block or tile walls where such walls are not subject to excessive moisture or dampness. Voltage rating for NM-B cable is 600 volts. 3 conductors, 1,000 foot spool. Meets or exceeds UL Standard 83, UL Standard 719, Federal Specification A-A-59544, and requirements of the National Electrical Code. Extra hard usage per NEC. Used for garages, portable tools and lights, battery chargers. Weather resistant for outdoor applications, dishwashers and refrigerators. 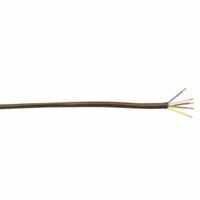 Resists most acids 10 AWG through 14 AWG, 60 degrees Celsius to 105 degrees Celsius. Soft annealed stranded copper per ASTM B3-90 conductor. TPE class 36, rubber insulation. TPE weather resistant class 36, black rubber jacket. UL 62, UL1581, CSA approved. Black, 250' spool. Extra hard usage per NEC. Used for garages, portable tools and lights, battery chargers. Weather resistant for outdoor applications, dishwashers and refrigerators. Resists most acids 10 AWG through 14 AWG, 60 degrees Celsius to 105 degrees Celsius. Soft annealed stranded copper per ASTM B3-90 conductor. TPE class 36, rubber insulation. TPE weather resistant class 36, black rubber jacket. UL 62, UL1581, CSA approved. Black, 250' spool. Extra hard usage per NEC. Used for garages, portable tools and lights, battery chargers. Weather resistant for outdoor applications, dishwashers and refrigerators. Resists most acids 10 AWG through 14 AWG, 60 degrees Celsius to 105 degrees Celsius. Soft annealed stranded copper per ASTM B3-90 conductor. TPE class 36, rubber insulation. TPE weather resistant class 36, black rubber jacket. UL 62, UL1581, CSA approved. Black, 250' spool. 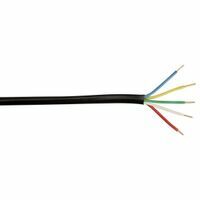 Pump cable, type THW, thermoplastic (PVC) insulated, 600 volt. All wire insulated. Type THHN insulation, rated 90 degrees Celsius, 600 volt. Gray PVC jacket. For applications of direct burial, dwellings not exceeding 3 floors above grade, underground feeder to outdoor lighting or apparatus, exposed or concealed wiring in damp, moist, wet, dry, and corrosive locations, general branch circuit wiring and new wiring or replacement wiring. Flame retardant, moisture, fungus, and corrosion resistant. Sunlight resistant jacket. JC-30B Federal specification, ASTM B-3, ASTM B-8 and NY state DOS 16120-880923-2002. UL Listed. Premium grade flame retardant black PVC jacket. Rated maximum 90 degrees Celsius dry and damp, 600 volt. General purpose building wire for services, feeders and branch circuits. Resistant to abrasion, acids, alkalines, ozone, and water. UL Listed. Inner conductors are type THHN, rated 90 degrees Celsius, 600 volt. Solid strands. Outer jacket is PVC, rated at 75 degrees Celsius. Amp rating of the product is limited to that for 60 degrees Celsius rated conductors per the National Electric Code Article 336. Dwellings not exceeding 3 floors above grade. Exposed or concealed wiring. May be fished through walls, ceilings, and masonry blocks. Use for new wiring or replacement wiring. Only for use in normally dry locations. UL Listed. /2 = 2 insulated wires with bare ground. /3 = 3 insulated wires with bare ground. Compact stranded 8000 series aluminum alloy. Cross-linked polyethylene (XLPE) insulation. Multiplexed cable conductors with a left hand lay in a Triplex (3 conductor) assembly. Underground distribution from a supply source to the service entrance equipment of a building. Maximum operating temperature of 90 degrees Celsius in dry and wet locations. 315 amp maximum in direct burial application or 240 amp in ducts. 4/0 - 4/0 - 2/0 x 500' spool, 600 volt. Black color. UL Listed Type USE-2. Premium grade flame retardant black PVC jacket. Rated maximum 90 degrees Celsius dry and damp, 600 volt. General purpose building wire for services, feeders and branch circuits. Resistant to abrasion, acids, alkalines, ozone, and water. UL Listed. Wiring for industrial machinery, washing machines and various other large appliances, heavy-duty tools, motors, and temporary electrical power and lighting installations for construction sites. 8 gauge, 3 conductor stranded with insulated ground . Rated -50 to 105 degrees C. 40 amp, 600 volt. RoHS Compliant. Pump cable, type THW, thermoplastic (PVC) insulated, 600 volt. All wire insulated.